The respected Russian liberal newspaper Novaya Gazeta published the investigation of its special correspondent Yulia Polukhina titled "Smugglers in power" on shady side of war in eastern Ukraine. Ukraine Today has presented a shortened version of the text. The first dimension of war exists in geopolitics and TV-propaganda space. The clash of ‘Russian world' and free Ukraine goes on there, reads the translation provided by Ukraine Today. The second dimension is regular war – it's dirty, it's brutal, it's mainly harmful to the civilians who equally suffer from shelling, terror, famine, plundering and violence. The third dimension is fighting for money. Donetsk and Luhansk were always the regions where people used to make money in different, not necessarily legal ways. During the last quarter of century, a peculiar economical mode formed up there, administrative, financial and openly criminal interests tightly intertwined within it. For the local elites, both Maidan and ‘Russian spring' (propaganda name for Russian invasion to Ukraine – UT) were equally disturbing developments which had shifted the balance and led to the grand redistribution that certainly was and still is followed by lots of deaths. The current situation – neither peace nor war – is practically perfect for the region turned into a giant criminal enclave. Within this version all the recent scandalous killings can easily be explained. Rinat Akhmetov – one of the richest people in Ukraine, owner of coal, metalwork, fuel and energy companies in the Donbass and other regions of the country. Resident of Kyiv. Armen Bagiryan (aka Buggy) – ‘Cassack' (Russian word for Cossack – UT) and smuggler from ‘LPR'. Killed in October 2016. ‘Baghdad' – head of the garrison of the ‘people's militia' in ‘LPR', ‘curator from Russia'. Aleksandr Efremov – influential businessman and politician from Luhansk. Former head of ‘Party of Regions' fraction in Verkhovna Rada, former governor of Luhansk region, currently under arrest. Evgeniy Zhilin – one of the leaders of pro-Russian "Oplot" organization – first in Kharkov, later in Donetsk. Business partner of Kurchenko, Yeremeyev and Zakharchenko. Killed in Moscow region in September 2016. Yuri Zyukov – former Deputy Minister of Coal Industry of Ukraine, businessman, business partner of well-known businessman Aleksandr Melnychuk. Read alsoSpiders in a jarAleksandr Zakharchenko – the head of self-proclaimed ‘DPR', former employee of ‘Oplot', one of enforcement structures affiliated with Rinat Akhmetov. Mikhail Lyashko (‘Misha Kosoy') – a kingpin. Killed in Crimea in December 2015. Sergey Kurchenko – one of the richest oligarchs of Yanukovych era, owner of assets in energy and media business, currently lives and works in Moscow. Igor Plotnitskiy – the head of self-proclaimed ‘LPR', former regional administration official. Aleksandr Rak – the director of ‘Agat' jewelry factory in Rovenky. disappeared under mysterious circumstances. Evgeniy Fainitskiy – worked for Sergey Kurchenko, the minister of energy and coal industry of ‘DPR'. Killed under obscure circumstances. Gennadiy Tsypkalov – prime-minister of ‘LPR'. Committed suicide in his jail cell after interrogation on charges of plotting a coup in October 2016. In April 2014, the group of armed men led by Evgeniy Zhilin and Aleksandr Zakharchenko captured the building of Donetsk City Council. A fragment of Zhilin's interview to Dozhd Channel: "Everyone was taking something under control then; we were hoping it would be like Crimea. We'd ask Russia for help and everything would be just fine". ‘Oplot' is an organization founded in 2010 in Kharkiv by Eugeniy Zhilin. It actively promoted the ideas of ‘Russian world' and actively opposed the supporters of Maidan. Currently registered in Russia. After seizing the power, ‘Oplot' immediately took under protection the residence of oligarch Rinat Akhmetov and several mansions of ‘Lux' mobsters (‘Lux' was the name of Akhmetov's residence in Botanic Garden in Donetsk). After ‘Russian spring' came, part of ‘Lux' mobsters went to Crimea, among them – Mikhail Mikhailovich Lyashko aka Kosoy aka Red-Eyed-Misha (he specialized in contract killings). He controlled the tobacco factory ‘Hamaday' and ‘Olymp' distillery. According to ‘Novaya Gazeta', Misha Kosoy lived in Donetsk when armed fighting broke out, but later he moved to Crimea. ‘Oplot' and ‘Vostok' (one more security company employed by Rinat Akhmetov, later reformed into a battalion under the same name and headed by Aleksandr Khodakovskiy) looked after Donetsk businesses. After Maidan had won, Zhilin moved from Kharkiv to Donetsk and tried to find his place in new reality, but faced some counteraction from the ‘curator' and went off to look for new patrons in Moscow. By the end of August 2014 there were reports that Zhilin was appointed a senior economic advisor in self-proclaimed ‘DPR'. "Zhilin… started to establish the shadow economy," Donetsk businessman Igor tells. "Zakharchenko (then merely a field commander instead of head of the ‘republic' – UT) was responsible for converting folks cash – more Russian money began to appear in everyday life, and less hryvnia… Later a conflict broke out among Zhilin, Zakharchenko and Bobko". A bit later ‘Oplot' leader Zhilin moved to Moscow and registered ‘Inter-regional sport and patriotic organization ‘Oplot' there. Zhilin was one of the first who started shipments of ‘humanitarian aid' to Donbass. The same transport was used to bring back ‘Hamaday' tobacco. Counterfeit products form Donbass appeared on Russian market. Besides, by fall 2014 ‘DPR' and ‘LPR' started to suffer from fuel shortages. Zhilin was in good terms with another oligarch of Yanukovich clan, Sergey Kurchenko – the latter was on the run then, but his companies continued to supply Crimea and Donbass with gas. Kurchenko was friends with MP Yeremeyev, Yeremeyev had left some fuel stations on ‘DPR' territories, both needed a middleman in Donbass. Zhilin claimed he had everything agreed over with ‘Kremlin curators'. A good acquaintance of Zhilin, Eugeniy Fainitskiy became a minister of fuel in ‘DPR'. The fuel from Kurchenko's companies started coming to fuel stations and later leaving via Mariupol to Kyiv-controlled territories. It most probably went also to supply Ukrainian army. For example, in February 2015, while fighting for Debaltseve was going on, Ukrainian Ministry of Defense signed up contracts with Yeremeyev companies, the sum of the deals equals UAH 593,91 million. Later – one more contract with ‘WOG Aero Jet', worth UAH 99.23 million. In December 2014 one more important event took place: the meeting of kingpins and criminal bosses who also needed to find out how to live in new reality. They decided the Donetsk criminals would spend most of their time in Crimea or Donetsk. One of the crucial questions was: how to provide operating and marketing of ‘Hamaday' fabric which was before the war and stays now a leader on a counterfeit tobacco market? There is a second fabric in Debaltseve which gets cigarette packages tailored for Europe. The same happens with the alcohol, by the way – on which they put any kinds of the most appealing labels. The supplier of fuel to ‘DPR' is ‘Donuglemet' company which has got the right to operate as a major monopolist by special order of Zakharchenko soon after he had become the head of the ‘republic'. It is believed that this company also runs under control of Akhmetov proxies. In February 2015 Fainitskiy was arrested by ‘DPR Law Enforcement', but later he was released and moved to Moscow. After that, both Zhilin and Kurchenko wound up cut off from ‘DPR' fuel schemes. When the armed fighting began in eastern Ukraine, shortages in coal supply started, although the mines still had been operating (excluding those under shelling). These are official numbers of regional statistics: coal output in Donetsk region in January-March 2015 dropped 3.1 times comparing to 2014. At the beginning of 2015 trading between Ukraine and self-proclaimed ‘republics' was officially forbidden. However, in February 2015 Rinat Akhmetov was allowed to ship off coal out of ATO-zone – from ‘Sverdlovantracit' and ‘Rovenkyantracit' enterprises. The territory of Rinat Akhmetov's mines was under control of ‘Cassacks' gangs. They cooperated with ‘LPR', but preferred to live by their own rules. According to one of the local Sverdlovsk was controlled by ‘Rim' people, Rovenky – by ataman Konkin, one of the few local ‘Cassacks', Stakhanov – by Pavel Dryomov. ‘Cassacks' controlled Slovyanoserbsk and Pionerske – these were two main smuggling channels to the free Ukrainian territory. Smuggling was the responsibility of a ‘Cassack' ‘Buggy', and at Pionerske – ‘Misha the Chechen'. This system was necessary to transport in food, goods, alcohol and tobacco. Also via this route, gold and silver scrap was transported. The latter went to Rovenky jewelry factory ‘Agat'. It manufactured products for both Ukraine and Russia. In 1990s Yuri Eugenievich Zyukov used to be the director of ‘Cosmonauts' Mine in Rovenky. That was when ‘Lux' group people approached him. They offered mutually beneficial cooperation. In 2002, when Victor Yanukovych had become Prime Minister, Zyukov took a seat of general director for State Enterprise ‘Rovenkyantracit'. Legal mines do not bring the same amount of profits as the illegal ones (‘kopanky'). Zyukov took illegal mining under his control in Rovenky. In 2010 a conflict started between him and ‘Lux' group. As a result of this, ‘Rovenkyantracit' went into the ownership of Rinat Akhmetov, Yanukovych's elder son Aleksandr got engaged into illegal mining and Aleksandr Efremov's son Igor controlled the process. ‘Our ‘Cassacks' guarded ‘kopanky' which had belonged to Zyukov, there were approximately 30 of them in 2014-2015,' ‘Cassack' Vadim says. "Plus, Melnychuk and Zyukov own the ‘Daryevskaya' mining and processing plant'. Aleksandr Aleksandrovich Melnychuk was a director of Rovenky oil depot. He supplied fuel from the company of Sergey Kurchenko, Yanukovych era oligarch. According to journalists, Melnychuk had got a deal with Plotnitskiy concerning shipments of illegally mined coal to Ukraine and Russia – via ‘Luhanskvuhillia' enterprise and others of the same kind. Since the beginning of 2015 Aleksandr Melnychuk had become Deputy Minister of Coal Industry in ‘LPR'. Sale of scrap metal in ‘LPR' was controlled by the same old ‘Lux' group – via ‘Cassacks'. ‘Metal went to the Ukrainian territories by route from Pervomayske to Zolote, there was a battalion stationed there, in which people knew what is being shipped and where to," Vadim the ‘Cassack' says. There is really a battalion stationed at Zolote, it consists of ex-policemen from Luhansk. The second Rovenky's ‘Klondike' is ‘Agat' jewelry factory. Its director was a City Council deputy, member of ‘Party of Regions' Aleksandr Rak. In 1990s he used to be a leader of one of the most violent and powerful organized crime groups. Current Minister of Energy of ‘DPR' Aleksandr Melnychuk used to be member of that group, too. By the beginning of the conflict Rak openly supported ‘Russian world'. "Aleksandr Rak used to work at his enterprise, he had his own – and very well-trained – security. He also used to help us as well," ataman Konkin says. "…Someone told me that Rak had taken a loan of a handsome sum, reportedly to open a bank facility, and after that he'd just disappeared. His wife was left behind to take care of the factory. As far as I know the enterprise has been working for all these two years". After fighting for Debaltseve ‘Cossacks' gradually lost their positions, while Akhmetov's people and structures became more and more confident and started to supply coal to Ukrainian enterprises on legal contract basis. After ‘minister of coal' of ‘DPR' Fainitskiy had been arrested, Zhilin had lost his fuel profits and went to ‘LPR'. They'd met a Russian curator for ‘LPR', a person with call-sign ‘Baghdad' and led some negotiations concerning smuggling fuel. Zhilin tried and found the way to negotiate with the ‘republic's' prime-minister Gennadiy Tsypkalov, who also owned several fuel stations. Also, he's facilitated a deal by which a security company belonging to both Tsypkalov and head of the ‘Ministry of Internal Affairs' (call-sign ‘Kornet') would guard the enterprises of ‘coal' deputy minister Aleksandr Melnychuk and Rinat Akhmetov. And – voila! – the fuel of already Russian oligarch Kurchenko started to flow to ‘LPR' instead of ‘DPR'. It was transported to Ukraine by railway. As for ‘Baghdad' – he was granted several illegal mines (‘kopanky') as a sign of gratitude. During the period of spring and summer of 2013, anti-smuggling and border control joint mobile groups was created in Ukraine. 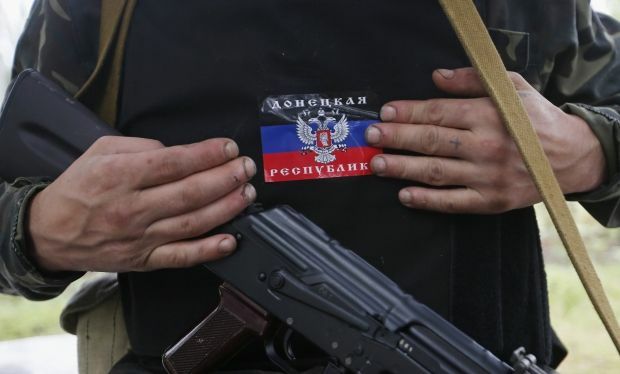 The so-called ‘Shchastia" group of Andriy Halushchenko started to work at the line of contact with ‘LPR'. According to his data, main groups of smuggled goods were alcohol and counterfeit tobacco. "Counterfeit tobacco is shipped to us; good licensed tobacco goes back there… The same situation with the alcohol, meaning counterfeit horilka (vodka in Ukrainian – UT) is shipped here and high-quality alcohol like beers, Champaign, cognacs – go one way there,"Halushchenko told to the TSN journalist. After fighting for Debaltseve has ended, in March 2015 tobacco concern ‘Hamaday' started operating as the whole unit. Both factories, in Donetsk and Debaltseve – went under ‘DPR' control, and that (sorry for being cynical) was the main victory for separatists. By the beginning of the summer 2015 ataman Konkin faces some criminal charges – evidently because he has become an unnecessary element in the schemes of Melnychuk, 'Baghdad', Zhilin and Akhmetov. On July 26, Ukrainian MP and businessman Igor Yeremeyey, who used to have tight connections with Zhilin and Kurchenko affairs, suddenly fell from the horseback, went into deep coma and died on August 12th. By the end of August ataman ‘Rim' was forced to leave Sverdlovsk: he was not allowed to cross the Russian border while going back to ‘LPR'. The same summer, the group of smuggling-fighters headed by Halushchenko and border guards intercepted five numbered bags full of gold and silver. These were valuables form ‘Agat' factory from Rovenky. The minimum cost of valuables was 500 thousand dollars. "Actually, there were not five but eight bags," one of Sverdlovsk ‘Cassacks' told ‘Novaya Gazeta' journalist. "This shipment was a responsibility of one of factory directors and Rovenky parish priest, Father Aleksandr Avdyugin. His wife (Mother) Galyna Buychenko – was a member of ‘Party of Regions' before the war and after oversaw the humanitarian aid. However, people didn't get any aid and started to complain. After gold had disappeared and humanitarian aid had been stolen, Mother was called to Ministry of Internal Affairs for interrogation. Later came up reports of her death". On September 2nd, at dawn, near the town of Shchastia in Luhansk region, the SUV with members of an anti-smuggling and border control joint mobile group exploded on an MON-50 landmine. According to another version, someone threw grenades and shot the vehicle by automatic weapons. Andriy Halushchenko and one more employee of state fiscal service died on spot. Three paratroopers and one SBU employee were wounded. On October 17 2015 the head of ‘Security Ministry' of ‘LPR' Leonid Pasechnik (without coordinating his decision with Plotnitskiy) arrested ‘energy minister' Dmitriy Lyamin. He was charged with "strict executing of the orders issued by criminal authorities concerning coal smuggling; trying to transfer strategically important fuel and energy enterprises under these criminals control". Thus, a new minister of fuel and energy in ‘LPR' appeared; it was Aleksandr Melnychuk who is believed to work for Akhmetov. In November 2015, Ukrainian prosecution started investigating the death of former minister of fuel and energy in "DPR", Eugeniy Faynytskiy. The request for investigation came from his brother residing in Kyiv. The case is still open. In December 2015 in Crimea, in his own house Mikhail Lyashko (aka Misha Kosoy) was killed with three shots in the head. "Mikhail Mikhailovich was killed because of redistributing control over illegal businesses. The war had shifted some balance in the criminal world," former good acquaintance of Zhilin, businessman Andrei tells. On July 30, 2016, the former governor of Luhansk region Aleksandr Yefremov was detained in Boryspil airport. He is suspected for being involved in creation of so-called ‘LPR'. On September 19, Zhilin was killed by hitman in ‘Veterok' restaurant in Moscow region. On September 20, the head of ‘LPR' Igor Plotnitskiy announced that there was a coup prevented in Luhansk. He blamed ‘former head of parliament' Aleksey Karyakin, ‘former prime minister' Gennadiy Tsypkalov and a colonel of ‘people's militia' Kiselyov, call-sign "Communist". Karyakin fled to Russia, Tsypkalov and Kiselyov were arrested. The next day Tsypkalov was found hanged in the jail cell. The fate of ‘Communist' is unknown. On September 21 Russian military advisor colonel Aleksandr Osipov (aka ‘Orlov') was killed while exiting the house. He was the deputy commander of ‘LPR' armed forces. There is a rumor that ‘Orlov' had a conflict with ‘Misha the Chechen' and his battalion over Pionerske village, one of the most crucial smuggling routes. The second route goes from Slovyanoserbsk (controlled by ‘LPR') to Lobachove (controlled by Ukraine). At the beginning of October 10 tons of cargo were transported via this route, among other goods – there were gold and silver for Rovenky jewelry factory. Armen Bagiryan (call-sign ‘Buggy') was in charge of this place. After the shipment, he went to meet someone of ‘first ones' … and was killed in 20 meters from his own car. "I found one thing particularly odd: after that ‘Baghdad's' man came, dived into ‘Buggy's' car, fished out some documents and left," ‘Cassack' nicknamed ‘Malysh' tells. Ergo: most of the stories about arrests and murders of prominent fighters for ‘Russian world' turned out to be merely criminal showdowns over the smuggling control worth many millions. The conclusion is this: during the last several months, a total clean-up of smugglers has been taking place. It means someone else wants to step into control and eliminate rivals as well as witnesses of all developments which had been taking place in the region for the last two years. Meanwhile Vladyslav Lyashko comes back to ‘DPR'. He is the son of kingpin ‘Misha Kosoy' who was killed in Crimea. The son takes over his father's businesses, Lyashko Junior is a long-termed business partner of Borys Kolesnikov who heads the ‘shadow cabinet' formed by ‘Opposition block' (remnants of Yanukovych's ‘Party of Regions').